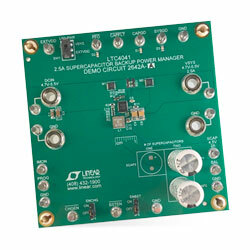 Analog Devices DC2642A evaluation boards are intended to evaluate LTC4041 supercapacitor backup power manager. This device is a complete supercapacitor backup system for 2.9V to 5.5V supply rails. The device PMIC operates with a stack of two series capacitors DC2642A-A and a single capacitor DC2642A-B. These evaluation boards show the design of a 5V rail with a short-term power backup using 10F supercapacitors. The boards provide input current limit, charge current limit, power fail threshold, charge voltage, and boost voltage. All these features can be configurable by modifying resistor values on the board. These evaluation boards consist of monitoring pins and LED indicators on status pins that are available to assist in the evaluation.